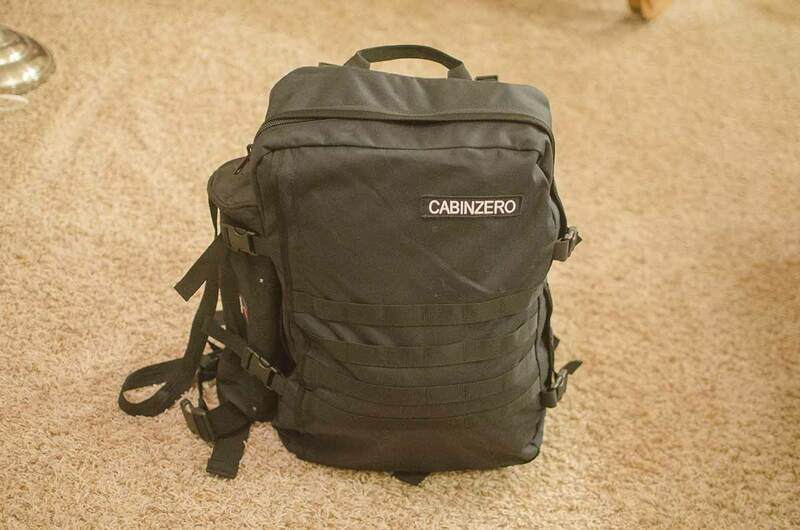 I had seen and heard good things about Cabinzero when they contacted me saying they wanted to send me a bag! They were confident that I would love their bag and wanted me to try one so I could share with all my experience with you, my readers. I was excited for the Military 44L Absolute Black bag to arrive, a bag specially designed to be the perfect carry on for an adventurer like me. The only problem was I didn’t have any upcoming flights to test it out on. Instead, I took it on a few hikes and road trips. I quickly realized how spacious and yet compact which made me wonder if this bag was the best one bag travel bag I’ve ever had. Disclaimer: This post is part of a sponsorship by Cabinzero. They sent me a free bag in exchange for an honest review. All opinions and photos here are my own. Using the discount code LIVETRAVELTEACH will give you a 10% discount AND me a small commission. 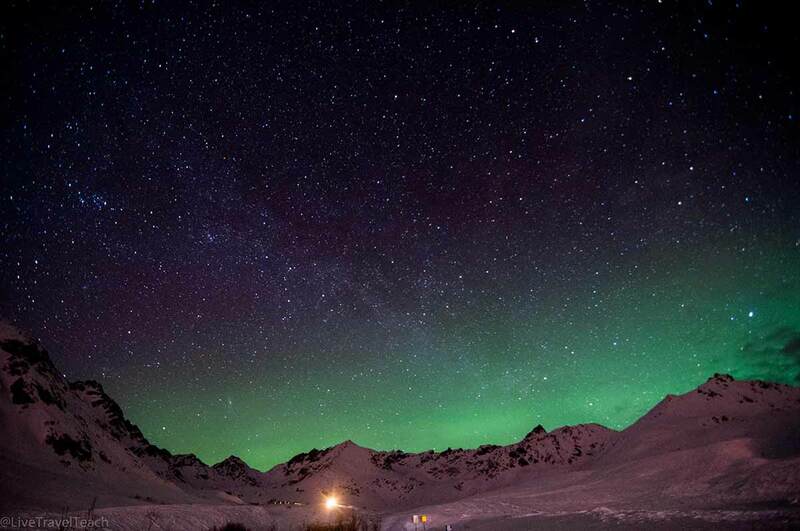 The Cabinzero Military 44L fit all my camera gear making this aurora shot possible! What is a one bag travel bag? What this One Bag Good for? One more Great feature on the Military 44L Cabinzero Backpack is an Awesome Zipper! What if I want a slightly different bag? A “one bag” is a bag used by a “one bagger,” or someone who fits everything they take with them on a trip into one bag. I first heard about one bagging on Reddit while planning my first one-bag trip to Vietnam. After that first one-bag experience I was hooked and thought that I’d never go back to “two-bagging it” like those backpackers you see with a bag on the front and a bag on the back, or perhaps carrying another in their hands. The idea of a one bag travel bag is that it will fit everything you need for your entire trip. Onebaggers want a spacious, yet sturdy bag and this Military 44L can actually cram a ton in! Before I get into the pros and cons I want to tell you a little bit about how I tested the bag. You see I wasn’t able to take it on any flights but I did strap it on for a cross-country ski afternoon and a climb up Flattop Mountain here in Alaska. 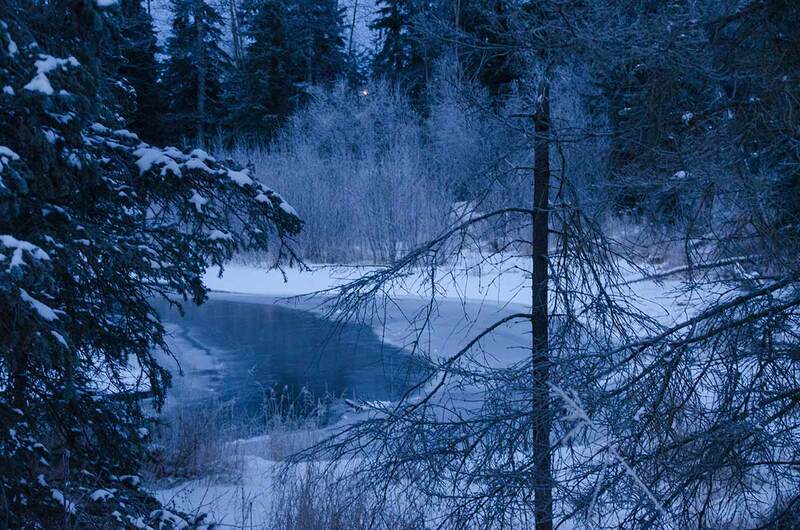 I took it on a road trip to Denali National Park and another to Hatcher Pass. Every time I stuffed all my clothes, camera gear, and travel essentials, into it I was amazed at how easily it all fit. Are you looking for a new one bag travel bag? Use code LIVETRAVELTEACH for a 10% discount on any Cabinzero bag! I’ll admit I was skeptical about taking it hiking but was happily surprised by its comfortable back padding and sturdy waist strap. 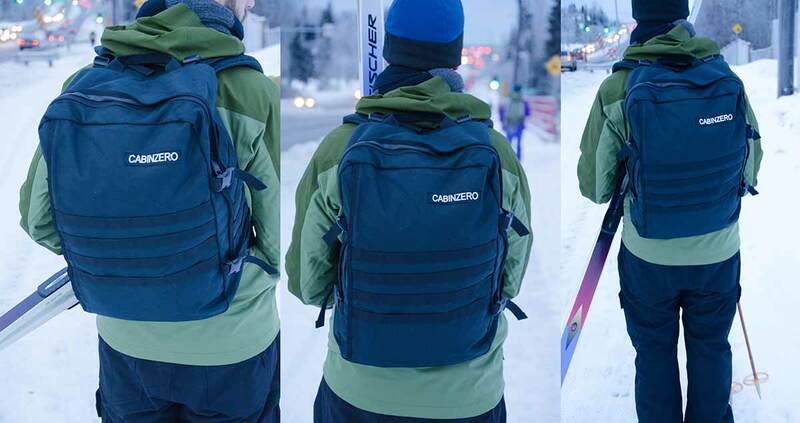 After a few hours of cross-country skiing or winter hiking up an arctic mountain, my Cabinzero military 44L was still in tip-top shape and could have easily gone longer. That’s right, you can absolutely use this bag for an adventure and not simply as a carry-on it is marketed as. If I was going on a longer trip and planned on walking/hiking 15+ miles I still prefer the Osprey 65L, a bag specially designed for that kind of long-distance backpacking. I’m confident the 44L Cabinzero could make the trip but there’s nothing quite like the support system on an Osprey and this bag is missing a good water pouch. Want a bag for long distance backpacking instead? This bag is perfect if you are taking a flight anywhere in the world. It’s especially great for adventure travelers who want a solid bag. The Military 44L Absolute Black is great for anyone jumping on a plane and having an adventure after landing. If you’re traveling somewhere and want to do a few day hikes or small excursions than you should pick your favorite Cabinzero bag! With one giant pouch you can easily stuff this thing to the brim. You can guarantee that this bag will fit as a carry-on. All Cabinzero bags come with an Okoban luggage tracker. You can track the bag if you decide to check it and if it gets lost you have a much higher chance of finding it. It has comfortable padding and a waist strap making it great for day trips. Smaller and lighter than traditional carry-ons. It can hold more than traditional carry-ons! The Military 44L Cabin Zero bag is ideal for anyone who takes frequent trips and loves to go on smaller excursions from there. If you don’t want to be bothered with baggage claim but still want to be able to travel comfortably and then bring you gear up a mountain than this pack is great for you. Don’t forget to pick to look at the Cabinzero Classic selection too. My Cabinzero Military 44L carried all my gear to the top of Flattop! The main advantage of the Cabin Zero Bag is that it is all one giant pouch which coincidentally is also its main drawback. Having one giant pouch makes it hard to organize what you pack. I’ll solve this issue when I fly to NYC by buying a set of packing cubes to compartmentalize my gear. Until then I solve the issue by strapping my tripod to the outside and having 4 smaller bags inside: one for camera gear, a drone bag, another for clothing, and toiletries. 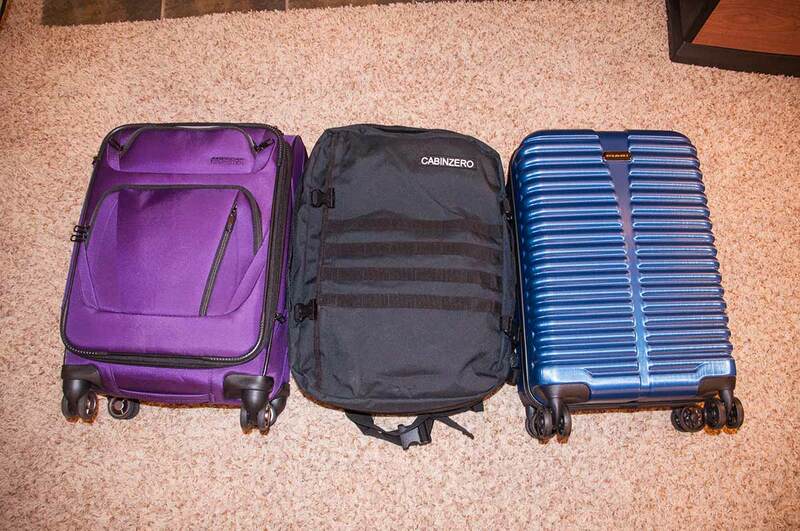 Check out my friend Barry’s guide for some great carry-on packing tips? The zipper on Cabinzero backpacks was designed to be a luggage zipper meaning it is sturdy and much harder to get stuck. If you’ve ever had a backpack with a crappy zipper than you know how important it is to trust your zipper when traveling. No matter how full I stuffed the bag I was always able to easily open and close this bag. Cabin Zero has dozens of bags to choose from ranging from 22L to 44L. Check them out on the Cabinzero Website and don’t forget to use my promo code LIVETRAVELTEACH for a 10% discount! Disclaimer: This post was sponsored by Cabinzero who sent me a backpack in exchange for the promise of an honest review an social media sharing. The opinions here are my own and the information here is accurate as of January 2018. That’s pretty dope that the bag has a tracker! Really impressive Mike. Traveling more makes me a minimalist by design. Not by intention per se because it sounds “in” but my bags get smaller, I pack less and I own less. This looks like a perfect match for any long term traveler. I couldn’t agree more that traveling makes you minimalist by design. Especially the longer you go. I find it nice to declutter my stuff and my mind while on the road. Nice setup – I just dropped my 46L carry on bag for a smaller 34L one. Took it for a test run around Asia for 6 weeks recently and it worked a treat. Much less stress! Yeah I’m definitely loving carrying a smaller bag for these long trips. Where did you go on your 6 weeks in Asia? i wanted to buy one but all of the Military bags are sold out on their website!